Sound Foundations is a comprehensive introduction to the English phonological system and an invaluable resources, whether you teach dedicated pronunciation lessons or you’d just like to improve the way you cover pronunciation in your classes? The book employs a discovery approach – you learn through physically experiencing how pronunciation works. I also suggest creative activities you can do in class with your students. The new edition of the book comes with an Audio CD containing recordings of the discovery activities. 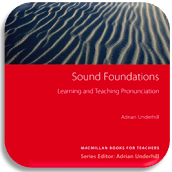 Sound Foundations is available to buy in the Macmillan online bookshop. For ISBN, price and availability visit Macmillan English. In Sound Foundations you make a natural progression from sounds to words to connected speech. It’s a book that restores you, the teacher, to your rightful place as a learner with a wealth of discovery activities which you can immediately share with your students, adapted or not as you see fit. The beauty of it is in this humanistic dynamic, which sets you and your students off on a journey of exploration and discovery. Soon they’ll be involved in the process of finding their own English voice – not through drills, mimicking and repetition but rather through awareness, experimentation and curiosity. I found this book extremely useful for learning phonetic script (IPA) for English. It also explains how the mouth makes different sounds. A really good companion for learning more about pronunciation in English. Quite technical but it is clearly explained. I seem to be in the minority in that I absolutely love teaching pronunciation, and it’s mainly thanks to this book, which has a very holistic approach. Pronunciation is not intellectual and abstract, it’s the physical aspect of language, involving the breath, muscles and so on. It’s actually very practical and great fun…students and teachers alike seem to fear it, but there is no need to, as this book will show you. It becomes a pleasure to teach and learn once you grasp the essential simplicity of it, and it’s very motivating for students as they can enjoy instant results…they, like you, will be excited by how quickly you progress.